In 1978 Laura Huxley founded Children: Our Ultimate Investment, an organization for the nurturing of the possible human. Mrs. Huxley will speak about the foundation's ongoing projects and elucidate the message of the unconcieved to the men and women who will be their creators. Introduced by Bernhard Trenkle, Dipl. Psych. Belief in one's personal efficacy is the foundation of human motivation, accomplishments and emotional well-being. This address will analyze the sources of people's beliefs in their efficacy, their cognitive, motivational and emotional effects, and how to build a resilient sense of efficacy for personal and social betterment. This presentation will focus on key emotional challenges in the mouther-daughter relationship and identify the forces that block mutual empathy and connection. We will hear the complaints that adolescent girls voice against their mothers, and explore how therapists can help adult daughters transcend distance and blame. This address suggests that what is needed in the field of marital intervention is an empirically-based theory about the disasters and masters of marriage. The theory also is an integration of behavioral, object-relations, system and existential approaches to marriage. This theory is described and presented in this address. 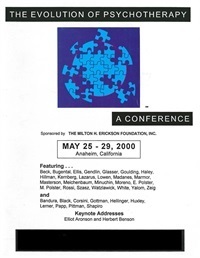 Supervision Panel 3 from the Evolution of Psychotherapy 2000 Featuring Eugene Gendlin, PhD, Harriet Lerner, PhD, and Salvador Minuchin, MD. Moderated by Michael Yapko, PhD. Most human emotions are fueled by three key emotions: anxiety, fear and shame. Our world and our relationships shrink or expand in direct proportion to our ability to manage these difficult emotions. Dr. Lerner reveals the hidden mischief and wisdom of these unwanted emotions, and offers a helpful and provocative perspective on the many faces of courage. Theory and rationale supporting a new unified approach to emotional • disorders are described along with some preliminary experience with the protocol. It is suggested that this unified treatment may represent a more efficient and effective strategy in treating emotional disorders, pending further evaluation. This address will focus on self-efficacy as the foundation of human motivation, well-being and accomplishments. Whatever other factors may serve as guides and motivators, they are rooted in the core belief that one has the power to effect changes. This address will analyze the source of people's beliefs in their efficacy, their cognitive, motivational and emotional effects, and how to build a resilient sense of efficacy for personal and social betterment. Psychotherapy practice, as we know it today, was born in World War II. Dr. Cummings was there, working with paratroopers in combat, and he has been a psychotherapist and mental health activist in the 60 years since. He wrote the first prepaid psychotherapy insurance benefit in the late 1950s and demonstrated that psychotherapy should be part of all health insurance. He has been in the forefront as an active participant in psychotherapy's achievements, setbacks and hopes for the future. 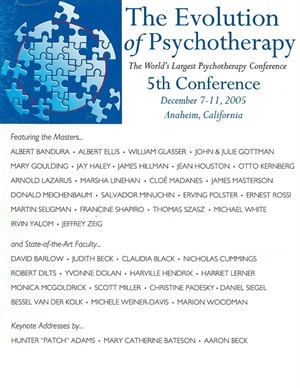 This address will highlight the 60 years of psychotherapy's evolution through the life of one of its leaders. Fifteen years ago, a group of Beckian cognitive therapists (including Padesky) proposed that personality disorders represent adaptive coping strategies linked to personal belief systems rather than permanent psychopathology. Today she describes her cognitive therapy approach to help people construct a new self. These methods offer an intriguing vision for the future of cognitive therapy.